UPTET Notification 2018: The Uttar Pradesh Basic Education Board (UPBEB) has released its UPTET Recruitment notification. The board is expecting over 5 lakh aspirants to appear for Uttar Pradesh Teacher Eligibility Test 2018. UPTET is held to recruit teachers for Primary and Middle schools in the state of Uttar Pradesh. The test is held on a yearly basis to select the best of candidates for the post of teacher. UPTET Recruitment Notification revealed the date for the release of admit card on October 18, 2018, but the admit card was released on 31st October 2018. The exam for the same took place on November 4, 2018, in offline mode. It is a state level exam. Candidates should start their preparation as soon as possible to get to the cut off score. Nationality Aspirants should be a citizen of India. Candidates belonging from Nepal/Bhutan/Tibet can also apply for the exam. Age limit General- Candidates must be between 18 to 35 years of age. OBC- Candidates must be between 18 to 38 years of age. SC/ST- Candidates must be between 18 to 40 years of age. PH- Candidates must be between 18 to 45 years of age. Educational qualification Candidates should possess a UGC recognised bachelor’s degree in B.Ed, D.Ed, BTC etc and should have obtained a minimum of 50% marks in the qualifying exam. Step 3 On the next page fill in your details like “Name”, “Father’s name”, “DOB” etc. Step 7 Click on “Submit” to submit the form. Step 8 Take a “Print out” of the form for future reference. UPTET Admit Card was released on 31st October 2018. The UPTET Hall ticket can be downloaded from the official website of UPTET within a specified period. It is advisable for the aspirants to secure the admit card till the end of UPTET admission process. It is to be noted that the candidates are required to download the admit card from the official website of UPTET and that it will not be posted to them through courier or in person. 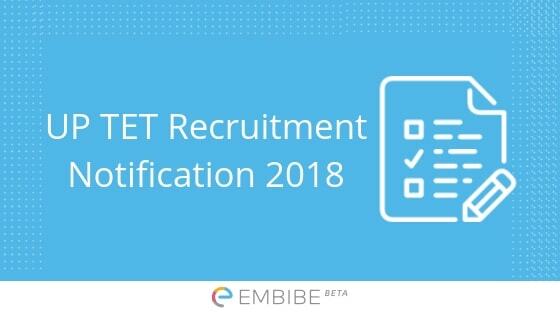 Now that you have all the necessary information on UPTET Notification, Embibe hopes you take your exam well without any further issue. As the exam is a state level exam, a fierce competition is expected. We advise you to prepare for the exam seriously and diligently. It is high time you start practising Mock test papers and test series. Complete your preparation and start with the revision. Take the test in a time bound manner and strategise your preparation plan accordingly. We hope this detailed article on UPTET Notification serves your need. If you still face issue do drop down your queries in the comment below and we will get back to you.